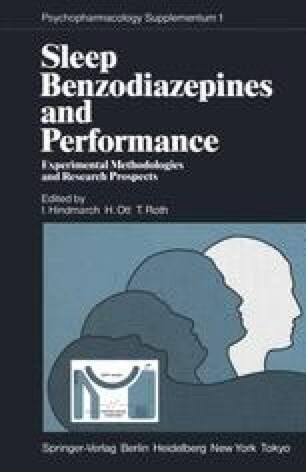 Since the presence of benzodiazepine (BD) receptors was demonstrated in mammalian brain tissue, simple, sensitive and rapid techniques have been established to use BD-receptor preparations for specific radioreceptor assays (RRA). The RRA allows in vitro estimations of receptor affinity and concentration of BD in biological material, e.g. the time course of total BD binding activity in plasma (parent compound and active metabolites) may be evaluated. Several studies in volunteers with short and long-acting BD used as sedatives and hypnotics including diazepam (DZP), flunitrazepam (FNZ), flurazepam (FZP), lormetazepam (LMZ), oxazepam, temazepam and triazolam indicate that pharmacokinetic data (e.g. elimination half-lives of receptor active compounds) concur with the results obtained from other methods, if active metabolites are taken into account. For the evaluation of BD long-term and hangover effects in two placebo controlled double-blind studies (placebo vs. 1 mg and 2 mg LMZ, 2 mg FNZ, 30 mg FZP, 10 mg DZP) BD-binding equivalents and pharmaco-EEG recordings, subjective state, psychomotor as well as cognitive function were determined by standardized methods up to 154 hours following drug administration. Compared to placebo a distinct long-lasting increase in the relative power in β-frequencies (12.5–30 Hz) and an impairment of psychomotor performance could be evidenced up to 12 h following FNZ and FZP intake. These effects correspond to the BD-binding activity in plasma. These findings indicate that BD-receptor preparations as used for the RRA are valuable tools to investigate binding affinities and pharmacokinetic properties of BD. Plasma levels of RRA active material may reflect a better correspondence to some clinical effects of BD than levels of the parent compound alone.